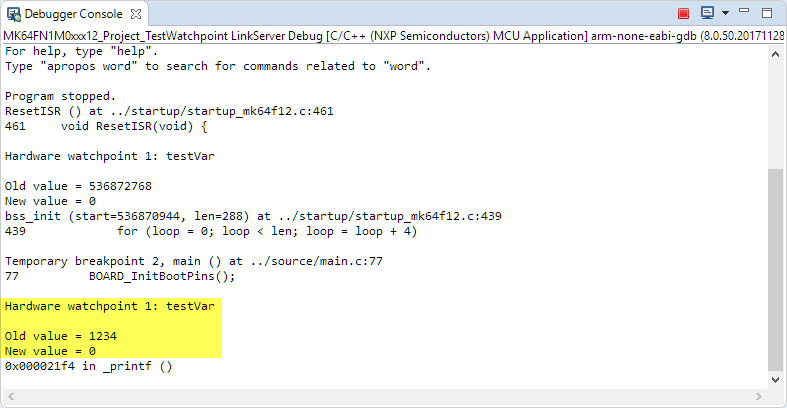 In this tutorial I show how to use the debugger with Eclipse/CDT to detect unwanted writes to variables or memory. 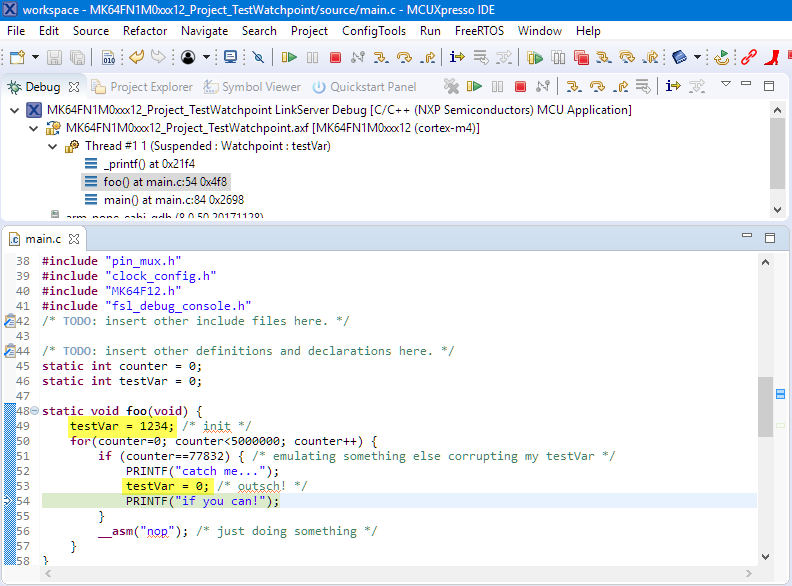 For this I’m using the NXP MCUXpresso IDE 10.2.1, but pretty much this applies to any other Eclipse with CDT. 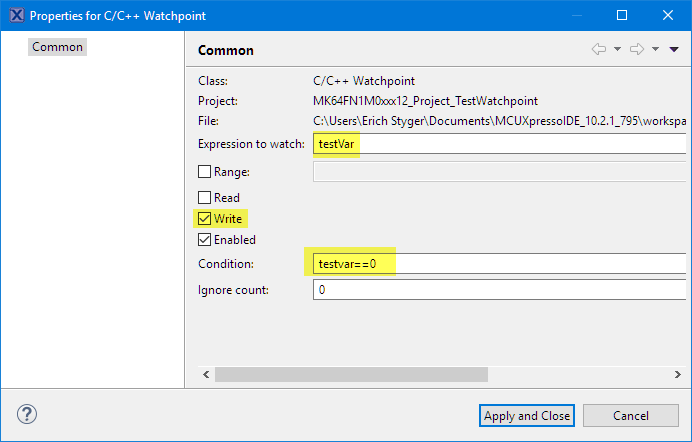 Eclipse is not really great exposing the watchpoint functionality, so this article should help you getting started. Watchpoints are a kind of ‘breakpoint on data’. It is assumed that the data is a global variable and not a variable on the stack. You might notice that the debugger stopped inside the printf() call. This because usually depending on the hardware there is some delay or jitter until the hardware comes to a full stop. This really depends on the hardware and how the debugger implements the watchpoint with the debug probe and hardware, but usually it sets up a kind of hardware trigger with ‘please raise a debug event if the data bus sees an access to that given address’. As usually this is handled in the microcontroller itself, this does not really affect the runtime behaviour of the application. Running our example again, it will only trigger and stop the debugger if a write access happens with zero. The ‘Ignore count’ can be used as a ‘count-down’ until it triggers, for example I can catch the 3rd time when the access and condition is true. 💡 Note that the range feature did not work well with early versions of Eclipse IDE’s and CDT. 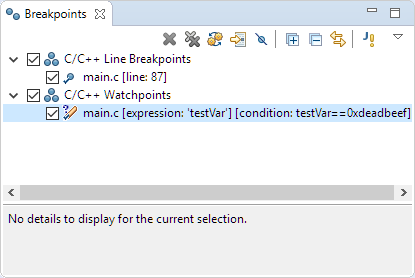 The watchpoints are listed in the Breakpoint view as other breakpoints. I can disable and delete watchpoints, but I cannot otherwise modify it. What I do is to delete and re-create it if I need to change it. So far so good. In my example there were not many access to that memory location where I had the watchpoint on it. src/gdb/gdb/infrun.c:2379: internal-error: void resume(gdb_signal): Assertion `!tp->stop_requested' failed. So what basically happens with conditional watchpoints (and breakpoints with conditions too) is that GDB stops, then evaluates the condition and if it is FALSE continues to run. This all takes time. 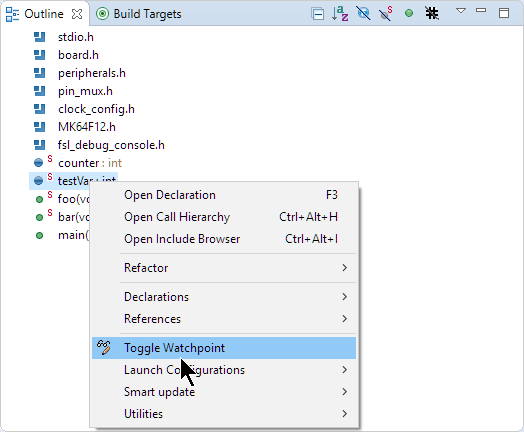 Watchpoints in Eclipse/CDT are somewhat hidden, but greatly help to detect read/write accesses to memory. Conditions are possible, but with the general way how they are implemented it makes code execution slower, especially with lots of accesses. Depending on your hardware it *would* be possible to set some hardware trigger with comparator and simple condition evaluation. But given the diversity of such hardware implementation and the fact that not many users seems to use watchpoints anyway, this is rarely supported, or rather complicated to setup. So using GDB watchpoints with hardware is great for read/write access, but adding a condition to the watchpoint usually comes with some costs. In a next article I’ll show how use instruction trace on ARM Cortex-M3/M4/M7 to catch rogue memory acesses. With using the hardware, I can solve the ‘normal’ watchpoint performance problem with condition. 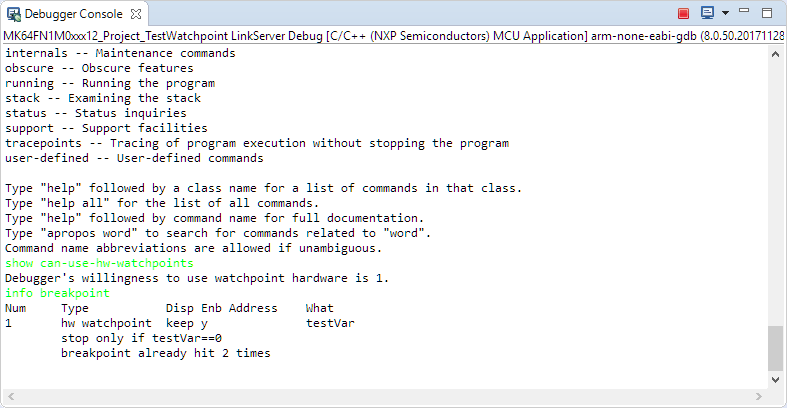 This entry was posted in CPU's, Debugging, Eclipse, Embedded, MCUXpresso IDE, Tips & Tricks, Tutorial and tagged Access, Breakpoint, CDT, Debugging, Eclipse, Eclipse CDT, MCUXpresso, MCUXpresso IDE, memory, NXP, Pointer Access, technology, Tips&Tricks, Watchpoint by Erich Styger. Bookmark the permalink. This is a amazing trick! 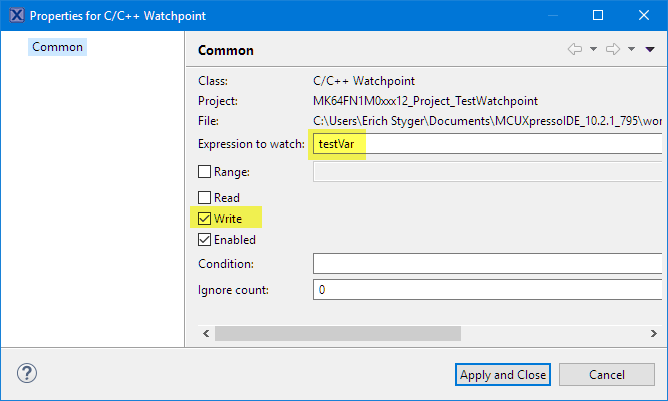 In the IAR compiler there is a similar feature, it’s called ‘live watch’, differently of ‘normal’ watch the ‘live watch’ update the variable in real time, however in Eclipse I didn’t found a similar feature, but with watchpointer the things become more easy! Such a ‘live watch’ variable monitoring unfortuntely is not provided in a standard way in Eclipse. It exists in multiple different implementation, e.g. for CodeWarrior, Kinetis Design Studio or MCUXpresso IDE.